Are you thinking about becoming a Beachbody Coach but need more information to help you make the decision? If so, you’ve found the right website. The goal of this post is to provide you with information and insights to help you decide if becoming a Beachbody Coach would be a good decision for YOU. My promise to you: I will not try to “sell” you on Beachbody Coaching. I’m not a salesperson and not in the business of trying to talk you into doing something you don’t want to do. If you have to be “talked into it”, there’s a good chance you won’t have much success anyhow. 1) It’s not about me…it’s about you. Don’t think that I’m trying to “make money” by getting you to sign up as a Beachbody Coach. Sure I’ll make a little when you join, but the initial amount is small and insignificant. I’m not looking to make a one-time sale. I’m looking to build a long term partnership where we work TOGETHER and help each other succeed. Try to avoid being cynical. If you sign up, and make a few sales, the amount I personally earn from that is very very small. My goal for each Coach on my Team is MASSIVE SUCCESS. I don’t want you to just get signed up. I want you to sign up and build a successful business for yourself. My success depends on YOUR success. We’re in this together. I can’t do the work for you. But I can provide ideas, tips, and strategies that have worked for me. I can help you “collapse time” and get quicker results by not making the same mistakes I made when I first got started. 2) Results are based on effort. What happens when a college freshman goes away to college and from day 1 doesn’t show up to class and parties all night long? The answer is obvious, they fail all of their classes. And who’s fault is it? If you decide that this business is right for you, and you accept that your results (good or bad) are based on your activity and your efforts, you’ll be ahead of 80% of all other Coaches. The majority of people make excuses, blame their sponsor, blame the compensation plan, blame the website or the products in someway, blame anything and everything they can think of. Except for the real reason…THEMSELVES. If you can take 100% ownership of your business, you can have success. Is Beachbody Coaching Right For You? We all have different ambitions, motivations, and intentions for getting signed up as a Beachbody Coach. These differences make it hard for me to give a one-size-fits-all answer and recommendation. For me to be able to give a recommendation to your specific situation, I’d have to talk to you for 5 – 10 minutes and ask you a few questions. Do you use and love Beachbody products? If you don’t use Beachbody products and feel great about recommending them to people, then becoming a Beachbody Coach is probably NOT the right decision for you. One of the requirements to be successful at building your Beachbody business will be that you use the products yourself and genuinely feel great about recommending them to others. I have no problem recommending Beachbody’s workouts or Shakeology because I know with 100% certainty that they will produce amazing results for anyone who goes through the program the way they are designed. Ultimately my clients will be happy and not regret their decision. There are many different reasons and scenarios where it would make sense to become a Beachbody Coach. The bottom line is, as a Beachbody Coach you have the opportunity to help change someone’s life physically, and financially. 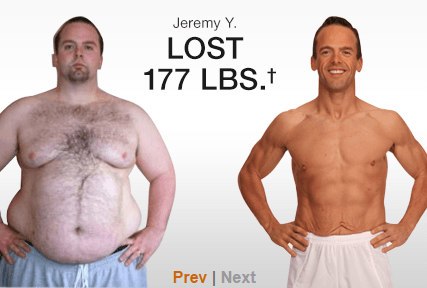 Real Results From P90x – Truly Lifechanging! Imagine recommending a program to someone that goes on to lose 100 lbs. There weight loss success spills over into their professional life. They get a promotion. Their marriage improves. Their entire life improves. And the ripple effect started because of YOU. Imagine introducing the business opportunity to a single mom of 3 that is struggling financially. She runs with it, and over the course of a couple years builds a very successful business for herself and family. And it all started because of YOU. Those are 2 realistic scenarios, and you can imagine how great it feels when you help someone improve their life (even though they did all of the hard work and heavy lifting). That feeling can’t be surpassed by any amount of money. This is a great reason to become a Beachbody Coach. It gives you a chance to make a difference in someone’s life. Beachbody Coaching isn’t for everyone, but if you’re still reading this post, I’m guessing you are very interested in getting started. My advice is to not over-think it. Get started and figure it out as go. We have great Team training that you can plug right into. Ready to get started?…Click Here To Get Signed Up Today! And, as with all of Beachbody’s products, signing up to be a Beachbody Coach comes with a 30 Day Money Back Guarantee. So if after a few weeks, you think you made a mistake, or aren’t happy with your decision, for any reason at all, you can send everything back and get a refund…no questions asked. When I first got signed up, I expected none of things I listed above. Having an open mind and deciding to sign up as a Beachbody Coach was one of the best decisions I’ve ever made. Initially I didn’t expect it to turn into a full time business for me. But once I “got it” and understood the potential, quitting my day job and turning Beachbody Coaching into my primary source of income became one of my primary goals. SEE ALSO: Do Some Beachbody Coaches Fail? If you breakdown the 3 Daily Vital Behaviors, the daily activities needed to grow your business, you can see that even if you never make a dime as a Beachbody Coach, the outcome can still beneficial for you. Be proof the products work. If we take the 3 behaviors above, what we are doing as Beachbody Coaches is, working out & drinking Shakeology, participating in personal development (reading, audio, learning, growing), and inviting others to do the same. For me, personal development has been a “game-changer” for me with my business, and more importantly in life in general. Even if I never made money as a Coach, the cost would of been worth because of what this business introduced me to in regards to personal development. If you are one of those people that think personal development, is BS, lame, hokey pokey, RAH RAH nonsense, I suggest you keep an open mind and give it a try. Test it out for a few months and then decide. Hint – One of the secrets to success is to work harder on yourself than you do your business. As you work on growing yourself, your business will grow as a byproduct of your own personal growth. I don’t “sell”, but instead I share, invite, and recommend. Instead of a salesperson, I’m more of a consultant. I talk to people and provide solutions to help them solve problems and reach their goals. Here’s the approach I like to take. Basically, we have a solution (that works) to offer people. If they want it, great, if not…no big deal. When I got signed up to be a Beachbody Coach back in 2009, I didn’t know exactly what it was I was signing up for. I decided to have an open mind and take a chance. After all it was only $39.95 to get get started, so the worst case scenario would be that I was out $40. That $40 ended up being the best investment I ever made. Deciding to become a Beachbody Coach has truly changed my life for the better in many ways. You’ll never hear me say it’s easy, but it’s definitely worth it!